The Google Fiber team has been quiet since November of last year, when installations were first taking place in Provo, Utah for a select number of residents. Well, Google has now opened up registration for the new service to residents who live along the old iProvo network that Google bought early last year. To get hooked up, residents must pay a $30 construction fee, then there are three tiers of service to choose from. Tier one is completely free for at least seven years, providing standard Internet access with speeds up of 5Mbps down and 1Mbps up. 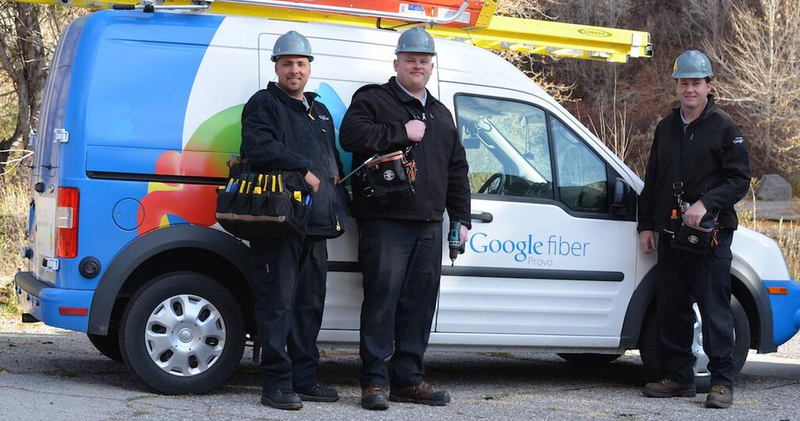 The second tier is your popular Google Fiber 1Gbps down and 1Gbps up for $70 a month. The final tier, which also includes Google’s TV service with hundreds of HD channels, ability to record up to 8 shows at once, and a 2TB storage box to store your shows will run you $120 a month. Google is rolling out installations across the first half of this year. Here are the timeframes for each Fiberhood in Provo. North Park – Thursday, February 20. Downtown Provo – Thursday, March 6. Pioneer/West Provo – Thursday, March 27. North Provo – Summer 2014. Southeast Provo – Summer 2014. Google is going all in with Provo, setting up demo stations in malls and upping marketing efforts across the area. It must be exciting to be a Provo resident. We are all very jealous.